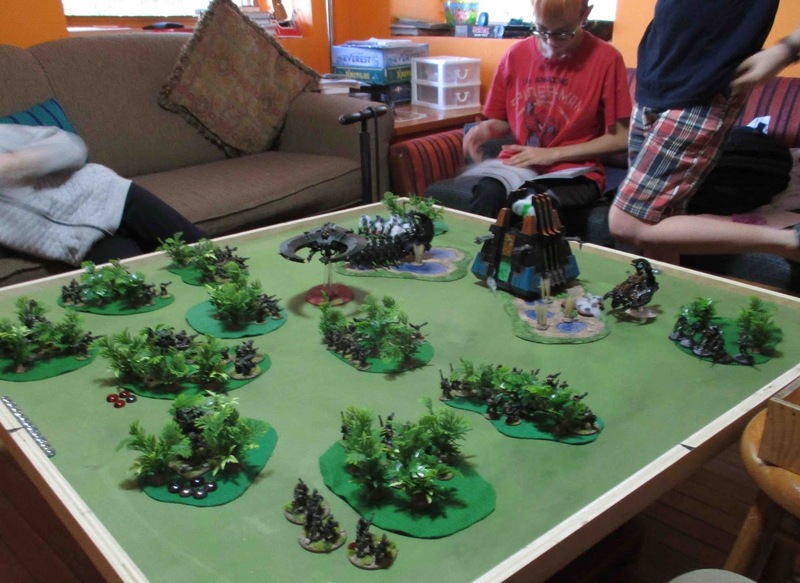 We had another crack at Warhammer 40,000 (8th Edition) on Saturday. I had hoped to write a fluff-filled reproof the desperate defence on Tractabon IV or a hopeless assault on Fwick's World... But then things ended up running late and we started the game late and were playing with too many things with too many people who had not read any of the rules or their Indices and we ran out of time just after finishing the FIRST TURN?! So... I'm not going to bother with fluff... But here are a few pictures of how the game went. We'd invited a friend of the kids over to play (we shall call him "General Beavis"). General Beavis is pretty excited about 40K and had been painting away at not one, but TWO armies for the last couple of years, but never really got to PLAY with them. His brother and dad both have armies, but neither are motivated enough or seem to be able to find the time to paint or play with their armies. 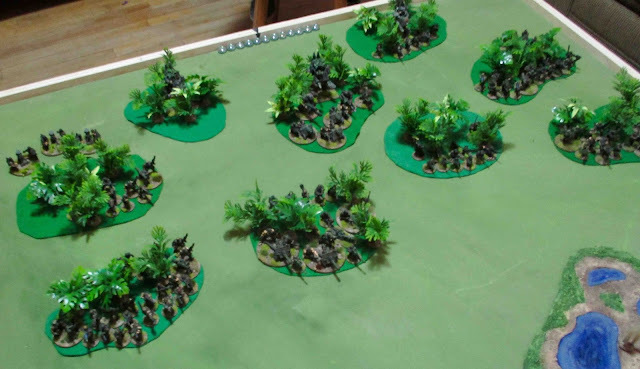 So I invited General Beavis to come over hand play with us on Saturday and told him to pick one of his armies and bring anything he wanted that was painted - we'd have something to match it. What he ended upbringing was 71 Power Level of Necrons. 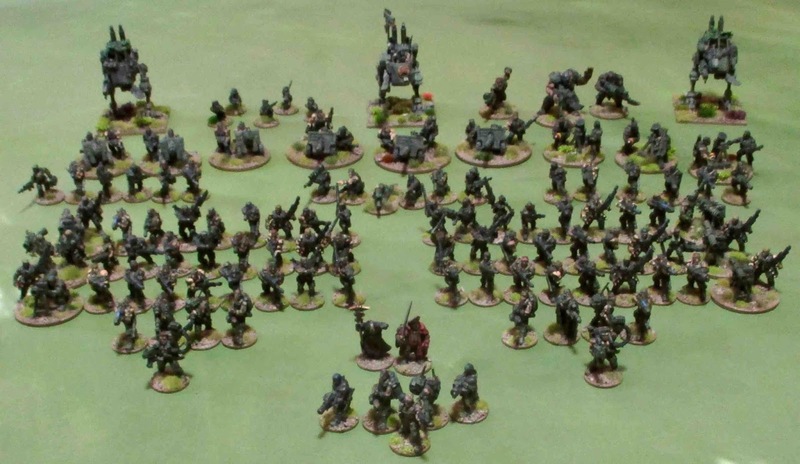 Finnegan doesn't quite have enough Orks to match that so I rolled out with my Guaiacan Commandoes. We took way too much time going over the rules and differences between 7th and 8th edition and then trying to figure out a scenario to play that wouldn't be too unbalanced for one side or the other (which was pretty much a hopeless endeavour in itself) and eventually settled on the "Meat Grinder" scenario - largely because the name and object (utterly destroy every last one of your foes!) was more appealing to 11-year-old boy than the "Ambush" scenario where the object is to escape and evade your foes! We played the Meat Grinder scenario straight out of the 40K 8th rulebook. 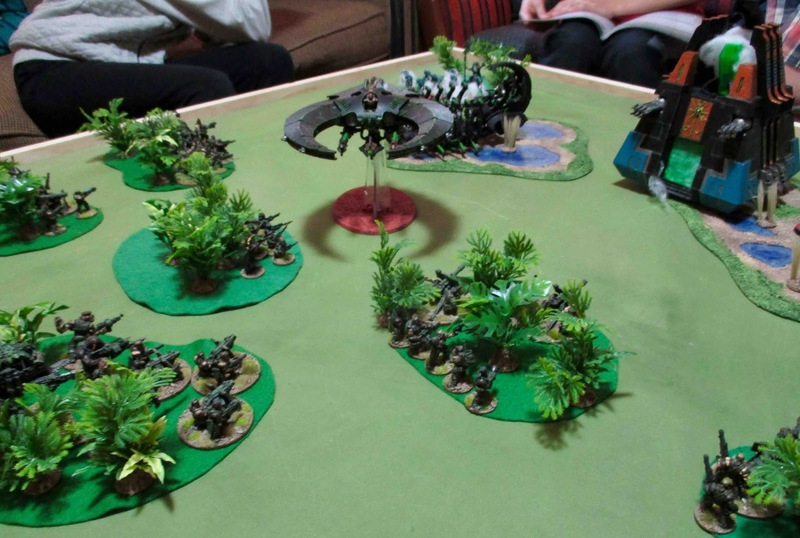 The Necrons were attacking and got to drop a preliminary bombardment on the defending forces of the Astra Militarum. They also got the Sustained Assault rule - which means if any of their forces were destroyed, they would roll for them on their next turn and come back on. Not that that was all that useful or necessary as the Necrons just keep reanimating on their own anyway. 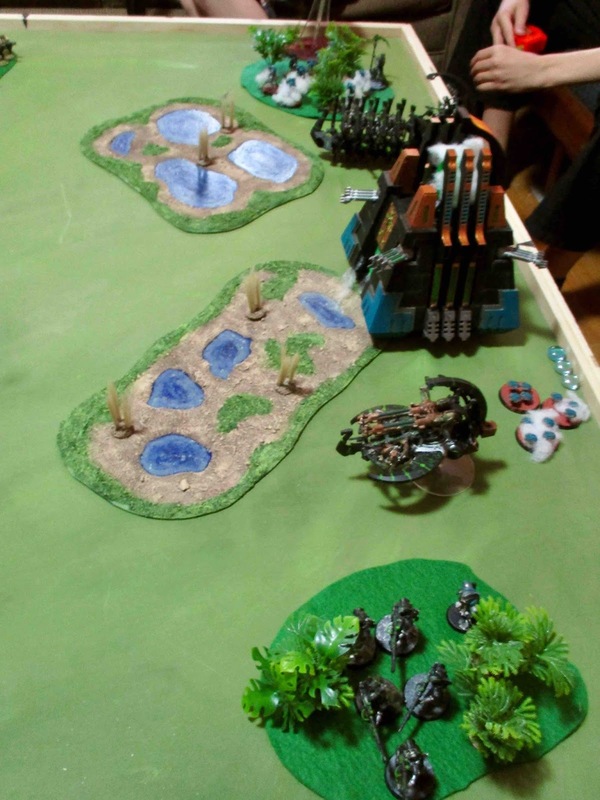 The Necrons had a variable amount of turns 5-7 to utterly wipe out their opponents. If there was a single Astra Militarum soldier standing on the battlefield at the end of the last turn the Astra Militarum would call it a major victory and the Necrons would be defeated...!? There was no doubt my force was out gunned by a way more powerful force - but could they kill all of my guys fast enough!? Then the Necrons set up - General Beavis let Finnegan play half of his force (Tarzan the Impudent, the Deathmarks, the Scarabs, and the Annihilation Barge). 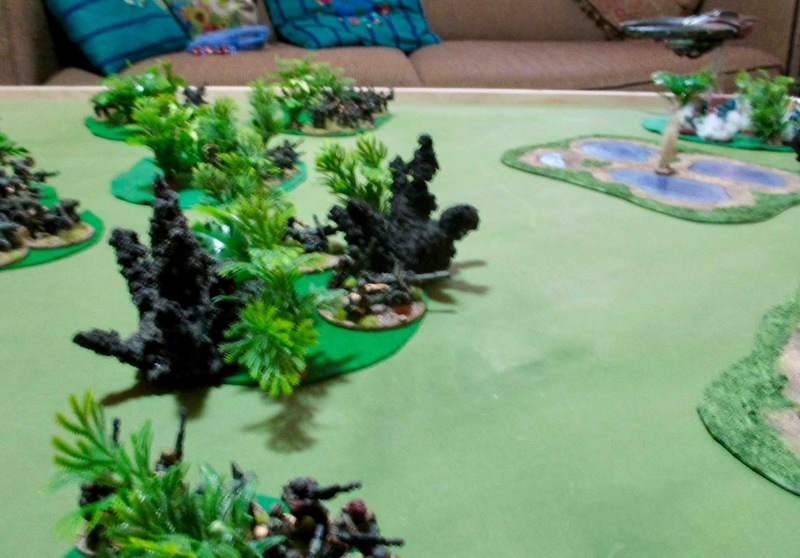 Then I revealed my force - The Girl decided to help me out and took control of the Scout Sentinels and the Ratling snipers. The preliminary bombardment took out 15% of my force! I lost a lascannon, the entire special weapon section armed with snipers, 2 members of the demolition team, BOTH platoon command sections - less one Heavy Flamer (but not the platoon commanders themselves - who are, in 8th edition, independent characters), and a few grunts from regular Infantry Sections. From the outset I knew there was NO WAY we were going to finish this game. we started two hours later than I'd intended and had a little over an hour to play before I needed to call it and get to work on some other stuff. the Necron leaders plot the DOOM OF HUMANITY! The Necron force went first and on their turn they trundled forward and lit up the AM front line! The Doom Scythe took out another lascannon and hit the Company command Squad (but they miraculously saved at hits!?) The Ghost Ark shot at an Infantry squad and knocked out half the squad. The Warriors shot up another infantry squad and knocked another 6 out of action. The Deathmarks shot up yet another infantry squad causing four casualties. The crew of the Annihilation Barge were apparently playing Candy Crush on their smartphones, because they couldn't hit a damned thing!? The Monolith wiped out another 7 infantry in various squads it targeted as well as causing a wound on the remaining lascannon team! Two squads lost another 4 due to morale roles (effectively finishing off two squads), a third squad WOULD have, but they were close enough to the Lord Commissar and so he shot one with his bolt pistol and the rest of the squad stayed put! On my turn this fellow, being the sole survivor of his unit, charged out in a suicidal attempt to get within 12" of the Annihilation Barge and unleashed a blast of supercharged plasma (risking self-immolation if he rolled a 1). Her rolled a pair of twos. I suppose at this point I should have used some command points to re-roll one (or both) of those... ah well..
We had to call it at that point - we'd already gone way longer than I'd intended as I still needed to prepare and review some stuff for the role-playing game I was running in the evening. I think it will go quicker when everyone has actually READ all the rules and knows what all of their stuff does. It was a mistake to play with such large forces while we're still (re)learning the game. We need to go back and do what we did with first game and play with 20-25 Power Level forces. 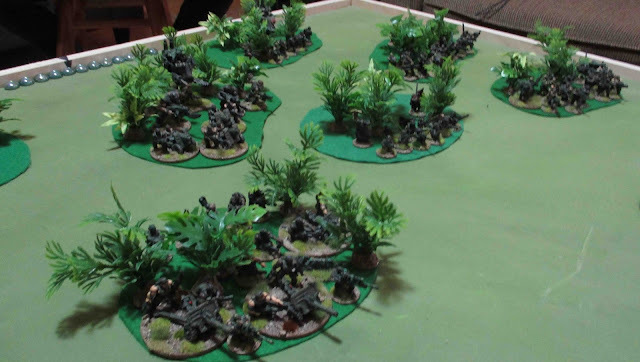 Although I'm not sure if Tarzan + Monolith versus Astra Militarum Infantry platoon is going to be any different (other than we might actually FINISH the game...). I have another squad of Tallarn Special Weapons on the workbench along with the last Heavy Weapons Squad for the Guaiacan Commandoes. Expect pictures of those in the not-too-distant future. I played my second game at ~90 PL last week and it took us 4h - same problem, too much looking things up with too much stuff on the table. But it definitely does play slicker than any previous edition and I find it entertaining. I think your take on the shortcomings (sit there and take it for 1/2 the time - or longer if you are mismatched) is accurate. You obviously need some heavy stuff to avoid the mismatch! Definitely think we'll scale it back to 20-25 PL games to start with for a bit and slowly work our way up from there! "...need some heavy stuff to avoid the mismatch!"? NEED? This is what bothers me most about bring and battle style of gaming (as opposed to most games I've played where I own both sides and construct interesting, relatively balanced scenarios based on what I have...). When your opponents have things you just can't beat, you are compelled to go out and buy another $200 worth of stuff so you can beat them... and then, of course they'll do the same... and so on... Maybe it's THEY that should consider buying and painting more TROOPS and field less tanks, monstrosities, and super-charged characters...? I do actually have a few tanks to build at some point. I picked up some 1/48 KV-2 tanks and I'm going to try and convert them to look something like Ragnarok tanks and I have a pair of Leman Russ tanks! I also picked up a few tanks at the FFG Black Friday sale a year or so ago for some weird war two game they had - they also look a little like KV-2 chassis but one has an anti-aircraft turret, that I'll use as a Hydra, and the other has a massive, short-barrelled, large-calibre siege/assault gun that I thought I could pass off as a Demolisher. But I was planning to paint all of those in khaki to go with the Tallarn force I'm working on. Looks like we may have another game planned for Thursday - this time with Power Level 18! hopefully we can get though a full game (or TWO!?) playing with that!